Hello! We are the Revs. 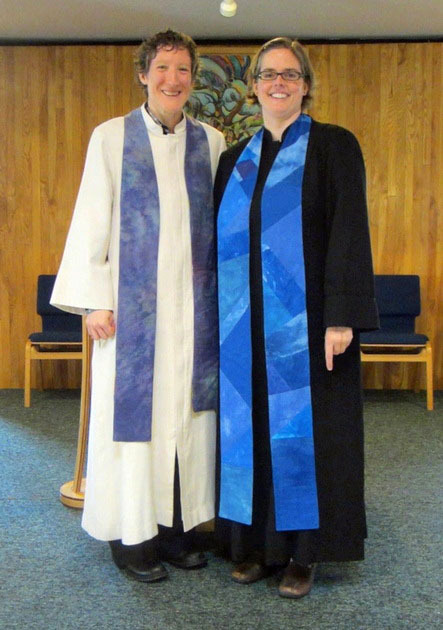 Cathy and Heather, and we are a Unitarian Universalist co-minister clergy family. 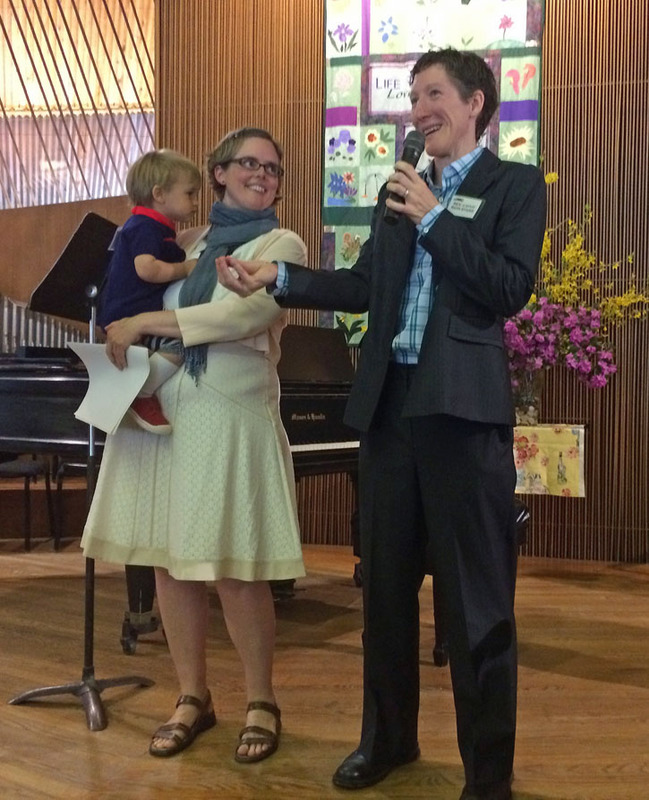 We were called to the Unitarian Society of Hartford in May 2014 and began our ministry here that August. On this page you can find out more about us and our journeys. We enjoy being a part of the Greater Hartford community and would love to hear from you personally if you’d like to talk with one of us individually. Wherever you are on your life journey, we welcome and encourage you! Cathy writes: I first heard of Unitarian Universalism as a 10-year-old, driving past USH on my way to Hartt School of Music for my weekly cello lesson. My parents, my two brothers and I moved to Hartford when I was seven years old, and I grew up in West Hartford, going to Duffy Elementary, Sedgwick Middle School, and Conard High School, and attending Westminster Presbyterian with my family. I left Connecticut for college in California over 20 years ago, and I am glad to be back in the area, closer to my family and serving in this community in which I grew up. 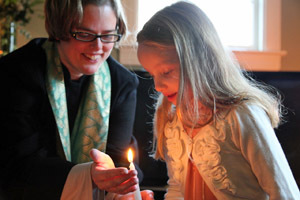 Heather writes: I am a life-long Unitarian Universalist from the Pacific Northwest, and I enjoy getting to know Connecticut through you—-through your stories and experiences, your hobbies and your favorite outings. When I was an Intern Minister in northern Minnesota 2004-05, I loved getting to appreciate and see the region through the activities and delights of the members of that congregation—-yes, there was some (gentle!) ice hockey and cross-country skiing through the back woods involved. I have now lived in five states and the District of Columbia, and in each place I have loved coming to know the area through the lives of you, its residents, newer and long-time. We met in 2010, when we were each well along our paths into ministry. Heather was beginning her fifth year serving the Unitarian Universalist Fellowship of Central Oregon, in Bend, and Cathy was beginning her internship at the First Unitarian Church of Portland, Oregon, after returning from traveling and studying in Transylvania during her fourth year at Starr King School for the Ministry. People and relationships are at the center of our ministry. We bring a wide range of congregational and life experiences and share with you our deep commitment to Unitarian Universalism. We appreciate the dedicated and collaborative approach this congregation takes to music and, as musicians ourselves, we enjoy weaving music throughout worship, congregational life, and the larger community. Our theologies align well with this congregation’s journey and ethos. We have an energetic commitment to social justice in our larger world. We split our full-time position as USH’s Minister equally, each working approximately half-time as Co-Ministers, and dividing many of the responsibilities of the ministry between us. We also have two small children. Whether you are new to USH, to Unitarian Universalism, or a long-time member, we would enjoy the opportunity to sit down and talk with you, to get to hear your stories, your concerns, and your hopes. 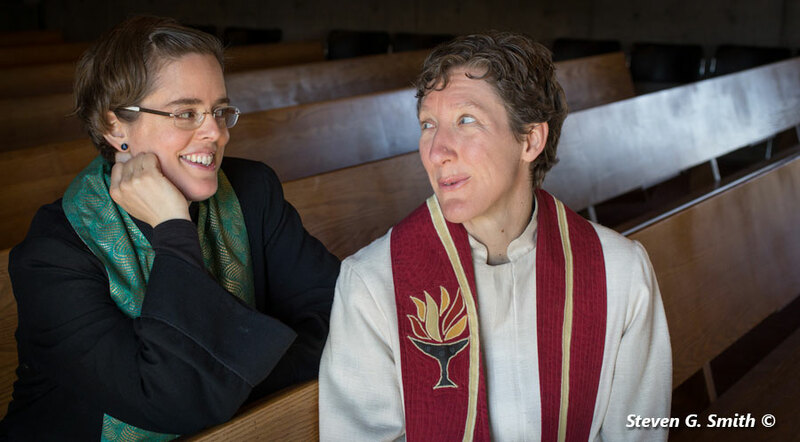 We hope you will peruse this site as fully as you wish to, and let us know what more you’d like to know about us, about this congregation, or about Unitarian Universalism. Click here for our schedule and how to reach us.